The Games Institute (GI) at the University of Waterloo originally came into being in June 2011, when the need for a formal research centre was deemed necessary to push the study of games to the forefront, and ensure that researchers from all departments and faculties at the university could be involved. The original founders Dr. Karen Collins (Drama & Speech Communications), Dr. Neil Randall (English), and Dr. Stacey Scott (Systems Design Engineering), collaborated to produce an environment where research and creativity from all disciplines could come together to show how games guide us, change us, and help us advance in a wide range of fields. From its inception, The Games Institute was designed to be a truly interdisciplinary setting. The existence of this unique research space was a key component to the foundation of the IMMERSe grant for the study of player immersion. The GI allows IMMERSe researchers from different disciplines to come together in collaborative partnerships that are fairly uncommon in many other academic settings. 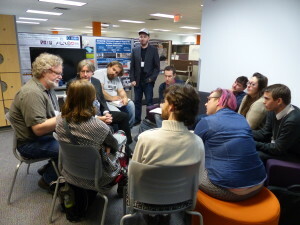 On any given day you will find graduate students and faculty members from the humanities, computer science, engineering, and the social sciences gathered to pursue the advancement of research and knowledge in games-related interactions and technologies driven by the six themes of IMMERSe. WatGAME – The Waterloo Game Analysis and Monitoring Environment – is a configurable games research lab located within The Games Institute facility. Specifically designed with IMMERSe research projects in mind, the WatGAME labs are equipped to simulate real-world spaces such as a living room, entertainment rooms, and social spaces where gameplay may occur. Different gaming technologies, monitoring and capture equipment, and data analysis tools assist IMMERSe studies with the aim of fostering innovation by developing in-depth knowledge of game play experience that can be incorporated into new game products and training highly qualified graduates with expertise in the field. IMMERSe activities at the University of Waterloo have leveraged funding for expanding the research facilities to include a new WatVRStory (Waterloo Virtual Reality Storytelling) lab co-located at The Games Institute and the Engage Lab at the University of Waterloo’s Stratford campus. Funded by the Canadian Foundation for Innovation (CFI), WatVRStory will focus on the creation of new forms of narrative and storytelling in media designed for virtual reality headsets. Directly under the Narrative and Dialogue in Games theme of IMMERSe, WatVRStory will advance the humanities-based narrative research in entertainment, education, health, and science to help Canada become a global leader in VR research and entrepreneurship. 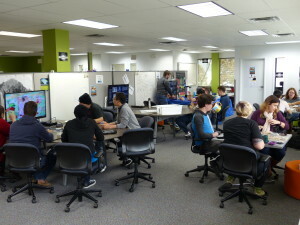 The Engage Lab is a lab affiliated with The Games Institute and located at the University of Waterloo Stratford campus. The focal point of this lab is gamification, most readily defined as the application of game structures, mechanics, and reward systems to traditionally non-game settings. Multi-institution conferences have been held at both the GI as well as the Engage Lab to bring together researchers in the name of games and immersion research. Also affiliated with the GI is the Multisensory Brain and Cognition Lab, directed by Dr. Michael Barnett-Cowan at the University of Waterloo. Investigating how the brain integrates multisensory information to impact the design of more immersive and engaging experiences in games for recreational and rehabilitative purposes, their research projects focus on improving human health and well-being using games technology. Since starting in 2011, many focused research groups have found their place within The Games Institute, stemming from IMMERSe partnerships. In relation to human-computer interaction (HCI), Waterloo HCI is a consortium of faculty and students at the University of Waterloo who carry out research in this field, with natural connections to game systems. The affiliated TouchLab directed by Dr. Mark Hancock, Associate Director of The Games Institute, is a research group dedicated to the study of human-computer interaction and information visualization. Several games have been developed as a partnership between the TouchLab and the GI, which would not have been possible without support from the IMMERSe network. Based at the GI, IMMERSe collaborator Dr. Lennart Nacke directs the HCI Games Group to conduct research in information and communication technologies, design, psychology, and human-computer interaction with games. Their projects span a wide range of the IMMERSe themes by targeting areas such as games user research, health and fitness gaming, as well as gamification of social recruitment applications. Also based at The Games Institute is the online games studies periodical: First Person Scholar (FPS). This middle-state publication aims to occupy the niche between academic blogs and journals in establishing an informed, sustained conversation about games. Maintained by graduate student members of The Games Institute, FPS publishes essays, commentaries, podcasts, and book reviews from both University of Waterloo writers as well as contributors from across the globe. FPS has contributed to the knowledge translation and dissemination goals of the IMMERSe network, reaching a broad audience upwards of 2,800 people by Facebook alone. 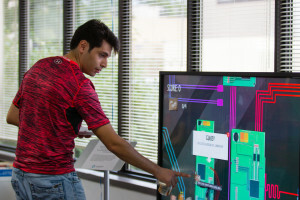 With support from the IMMERSe network, the GI has explored the human side of games and game-related technologies and interactions, compelling user engagement, and the intersections of games in business, entertainment, education, and health systems. To find out more about the research conducted at this interdisciplinary center, please visit their website.